One quick look at the walls of our home and you can tell the kids love to paint. Every room has a canvas or pottery piece one of the kids has made. At any given moment you will find an artist at work in our house. The easel out in my oldest daughter’s room, colored pencils strewn about my middle son’s bedroom floor, or finger paints covering the dining room table for the twins. We recently tried a new way to paint with Balloon Pop Art, and it was so much fun I had to share! 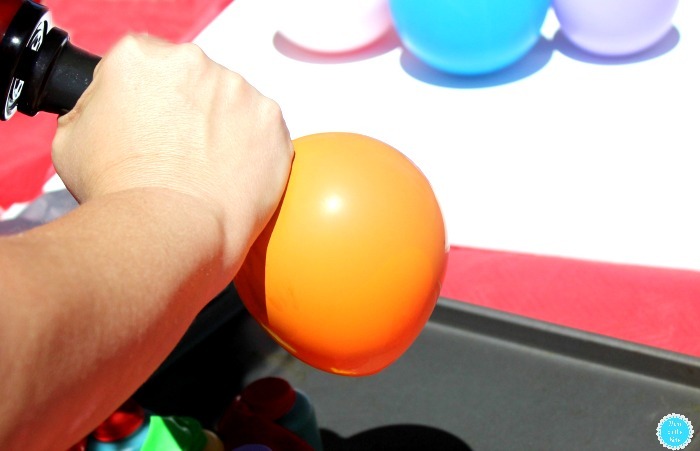 Balloon Pop Art is great outdoor fall activity the kids will go crazy about! 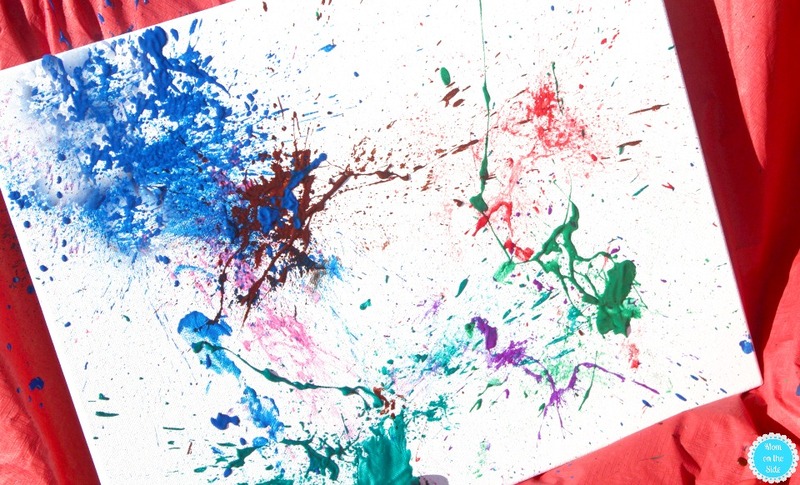 A few simple supplies and you’ll have a unique masterpiece to hang on the walls, made by your very own offspring! 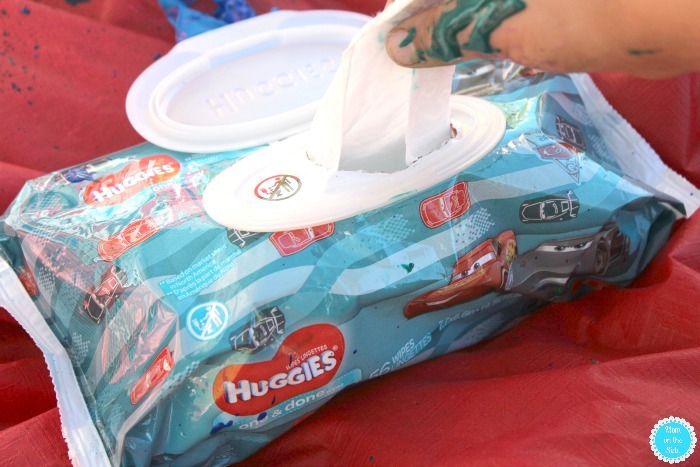 Planning a creative craft and want to use Huggies® One and Done® Wipes? Hover over the photo below to click through to Samsclub.com and buy them! It’s been over two years since my twins have been in diapers, but wipes are still on my shopping list. As long as there are kids in the house they will be a necessity. No matter the mess or occasion, Huggies One & Done are a sanity saver for moms of multiples, especially during the toddler and preschool years. They help tackle all kinds of messes because they are thicker for an ultimate clean**. Shoot, in the last week I’ve used them to clean up sticky sucker hands after a trip to the bank, wipe off muddy mud pie hands after a rain storm, unearth faces from fudge after baking brownies, and clean-up the mess of our Balloon Pop Art craft. Clearly, I go through a lot of wipes so being able to buy bulk boxes of Huggies Wipes as a Sam’s Club Member is convenient. Not only is it convenient but I love a little me time at Sam’s Club. Wandering around looking at all the new seasonal items, enjoying samples, and getting some shopping done. When the schedule is too busy for me time, I take advantage of Sam’s Club Pick-Up Service. Placing a quick order online at SamsClub.com and driving right up to the door at Sam’s Club to pick it up is a life saver some days, like when we have a fun craft planned like Balloon Pop Art! 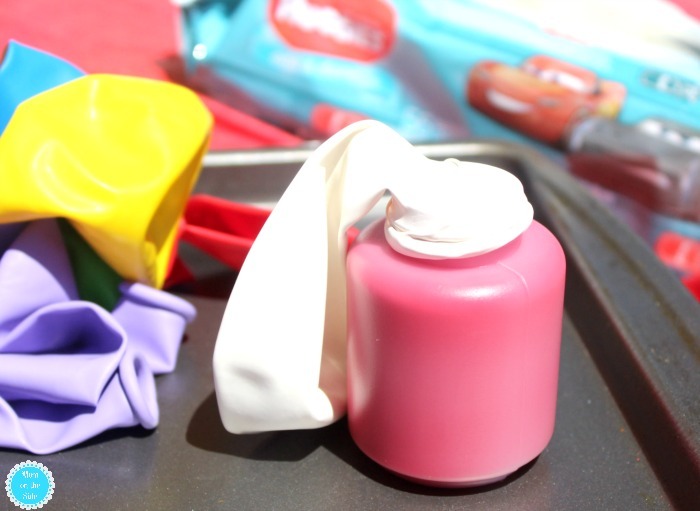 Open each container of washable paint and attach a balloon to the opening. I laid them all out on a cookie sheet to make things easier. Squeeze a little paint into each balloon and slowly remove it from the container. Take the balloon pump and fill each balloon with some air before tying. Only give it about four pumps, just enough so it is poppable. 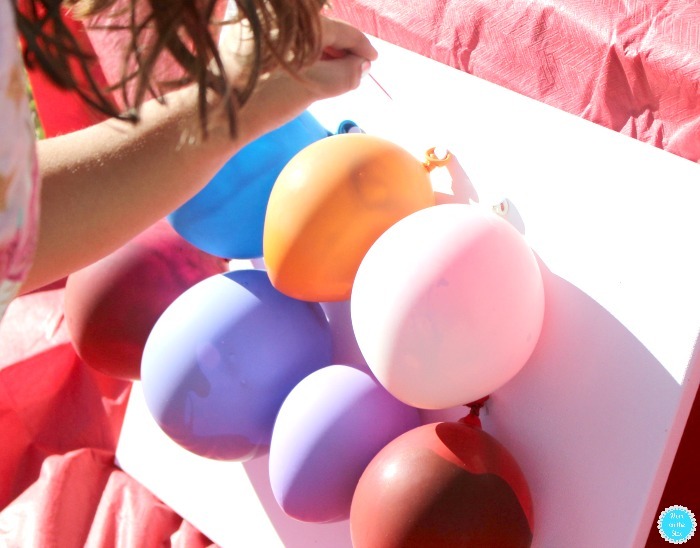 Attach the paint filled balloons to a canvas or craft board using thumbtacks. Now it’s time to get popping! Use a thumbtack or needle to pop each balloon one by one. My twins made this Balloon Pop Art together so they took turns popping balloons. 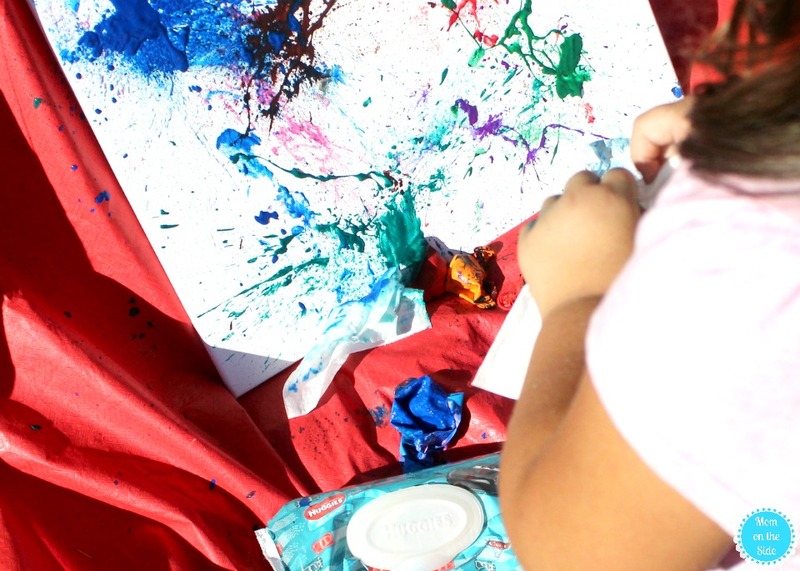 If you have more than one kid you can do that or give them each their own canvas or board. As each balloon is popped, the paint splatters and runs down the canvas. Kids love seeing the different splatters each balloon makes, and they go crazy about it because it’s messy! Kids love making messes and when you have preschool age twins messes happen. A lot. Big ones. Small ones. And all the sizes in between. I’ve reached a point of looking at messes, smiling, and often times joining in. Especially when they are the crafting and painting kind because I know Huggies One & Done Refreshing Wipes have my back as the #1 branded wipe*! With EZ Pull® Dispensing that allows you to get one wipe at a time, the kids can easily clean their hands up on their own. 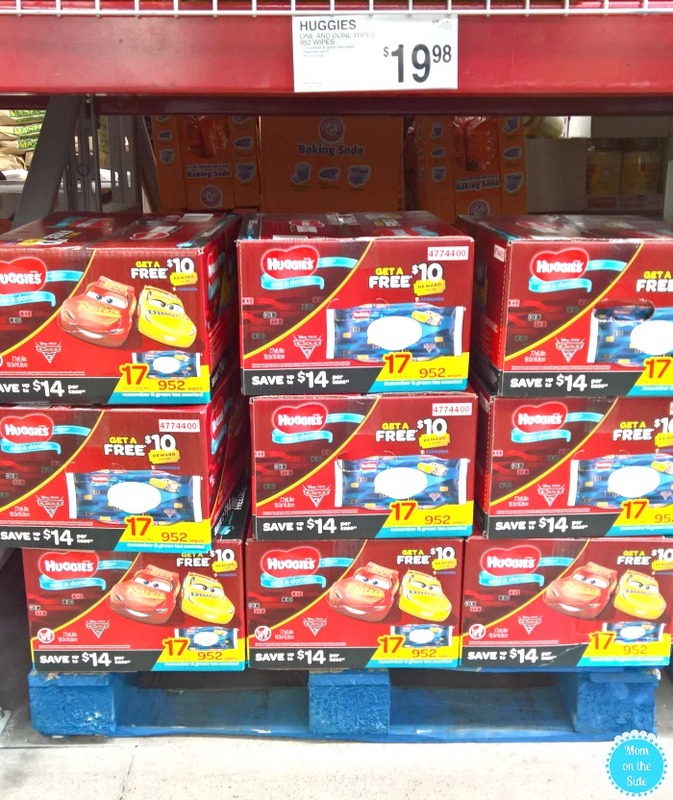 Through September 17th, SamsClub.com is offering free shipping on wipes as well $8.00 off instantly when you buy 2 packs of Huggies One & Done! I really like that they come in the handy soft packs that are great for wherever you go, and they fit nicely in my van door for cleaning up messes in the car. 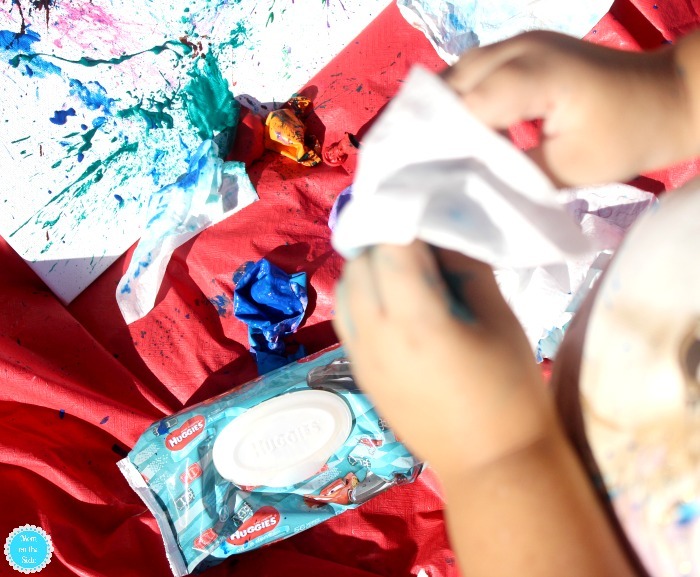 Whether it’s Balloon Pop Art or regular daily life with kids, embrace the mess while tackling clean up with confidence using the help of Huggies Wipes! we couldn’t figure out how to get the paint in the balloons and then the pump didn’t work right and got paint in the pump… total fail for us..
Oh no! I’m sorry it didn’t work out! To get the paint in the balloons I squeezed the container a few times until I felt some plop into the balloon. For the pump, I did it really slowly to avoid sucking the paint back in.